with any brand. The problem of course is knowing where to start, as there are literally thousands of options to choose from. Well, Turnkey Flyers might be the answer. Making real estate flyers and brochures is easy when you start with templates. Usually, if you can point and click your mouse you can design professional looking flyers online in minutes. Below are several online services that offer free Real Estate Flyer Template designs. I'm biased towards Turnkey Flyers and don't mind admitting it. They offer colorful, professionally-designed property flyers that are easily customized. Plus, you pay once for the templates but can use them over and over to design as many customized flyers as you'll ever need. Turnkey features a downloadable PDF real estate flyer template package that allows agents to create an open house flyer anytime in 5 minutes or less. This is an excellent marketing resource for agents that they can use for your entire real estate career! 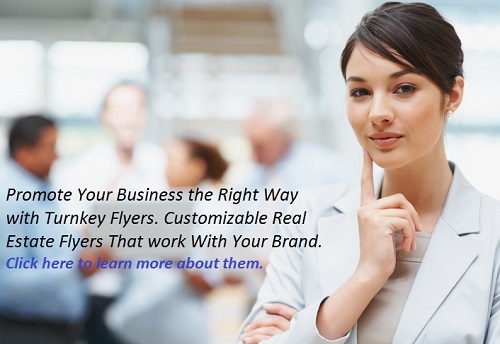 Below is a video that shows you how fast it is to create a flyer using Turnkey Flyers. Vista Print is one of my favorite sites for designing flyers, postcards and brochures. It's a little slow loading, but my computer is long in the tooth and needs some serious upgrading. Having said that, there are plenty of templates to choose from. Plus, you get to see what the finished product looks like should you want to place an order before ordering it. Xerox offers free flyer templates that you can use whether you're an agent looking to sell a listing, or a home owner selling fsbo. There's a nice collection of customizable, easy-to-use flyer templates to choose from. The Paper Mill Store has a large selection of flyers, brochures, business cards and other marketing materials that you can design and print. It seemed a little confusing to me, because you have to download and unzip files to your computer. However, I admittedly am not the most savvy computer user. Despite that I think it's worth checking out. Here's the point. You almost can't go wrong using flyer templates; whether you're creating a Just Listed, Just Sold Flyer, or Open House Flyers. You can also use them for leased properties and exchanges. However, in the end you'll need to exercise a little patience, because no matter how simple it is to use a site's templates there's an associated learning curve.